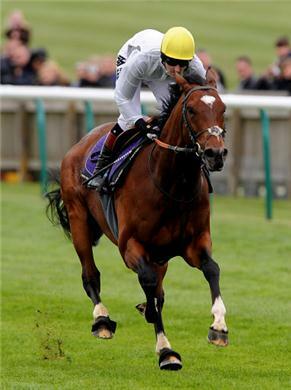 On October 20, 2012, a star of British thoroughbred racing retired. So, too, did his pace-setter and half-brother, Bullet Train, as well as the valiant Nathaniel, the only horse to have gotten as close as a head to the incomparable Frankel. Since that day, tributes to Frankel have abounded in sports journals and on-line chat sites world-wide. Our tribute pays homage to the team that supported Frankel before and throughout his racing career. For, even though in time we may learn that Frankel had a lung and heart capacity far greater than most thoroughbreds, had there not been a brilliant band of horse people to develop his body, mind and spirit, he would never have blossomed into the conquering hero he was to become. In the romance of the turf, champions are born. But that doesn’t really happen. A thoroughbred comes to a trainer with his or her abilities and potential. And, like all great teachers, it falls to that trainer and his or her team to recognize and develop it. 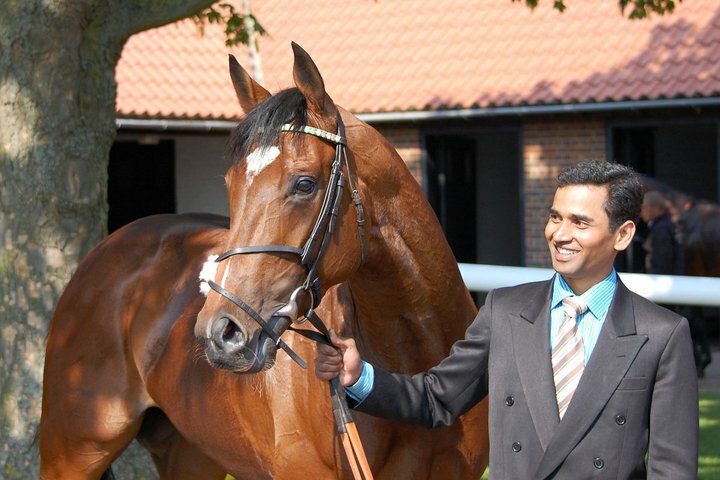 In all the emotion that accompanied Frankel’s last, triumphant appearance on a race course, the observation that still hangs in the air belongs to Lord (Teddy) Grimthorpe, Prince Khalid Abdullah’s racing manager, who reflected, “It’s just extraordinary that Henry could keep this horse fit for this amount of time.” By which he meant that there is no greater challenge than keeping a personality like Frankel happy within himself over a career that has spanned three racing seasons. 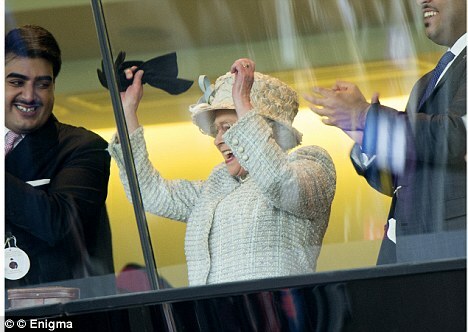 Her Majesty, Queen Elizabeth II, shows her enthusiasm for Frankel’s last victory (October 20, 2012) from the Royal Box at Ascot. Frankel heads to the wire to win the Champion Stakes at Ascot from a very game champion in his own right, Cirrus Des Aigles. Race horses spend a lot of time in their stalls. They follow a monotonous and exacting training schedule. As necessity would dictate, there is little variance from one day to the next and precious little to occupy the mind. So it follows that a horse like Frankel, filled with zip and vinegar in extremis is going to need the vigilance of a master trainer to keep him not only fit, but keen to race. Being full of zip was likely Henry Cecil’s first impression of the “Galileo colt” who turned up at his Newmarket stable, Warren Place, as a newly-broken juvenile. As is now generally known, Frankel didn’t have a mean bone in his young body, but he was exuberant, headstrong and undisciplined. As an offspring of Galileo, Frankel’s dominant personality and forceful character were bred in the bone. He was a rambunctious teenager … with a mind of his own. 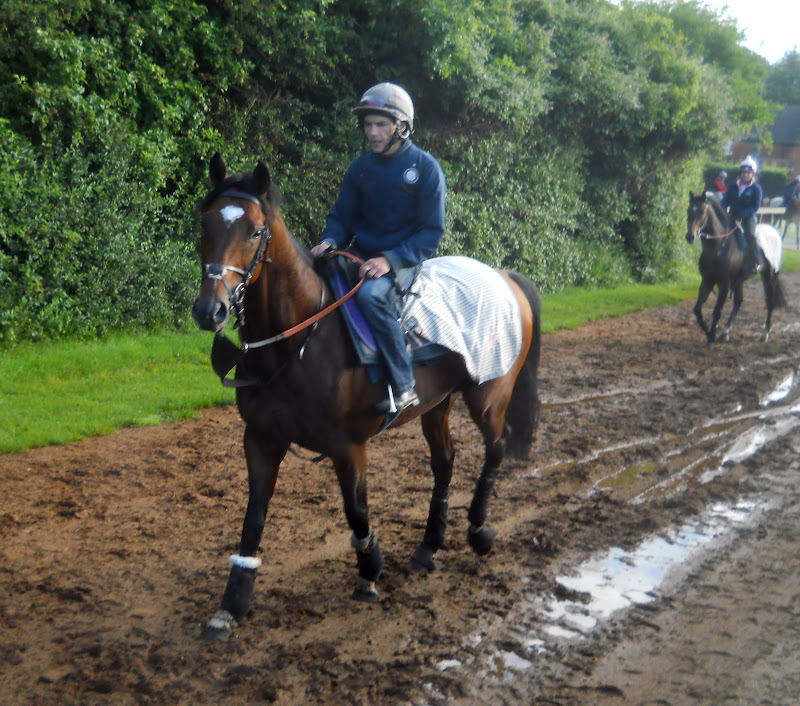 The first time Tom Queally galloped Frankel, he returned white-faced. He had never felt such raw, unbridled power. On the gallops, Frankel really just wanted to take-off running — in any and all directions. Apparently, the first time young Tom Queally took him out on a Newmarket gallop, he returned from the experience white-faced. He’d never sat on such speed before….such uncontrolled force, that is to say. 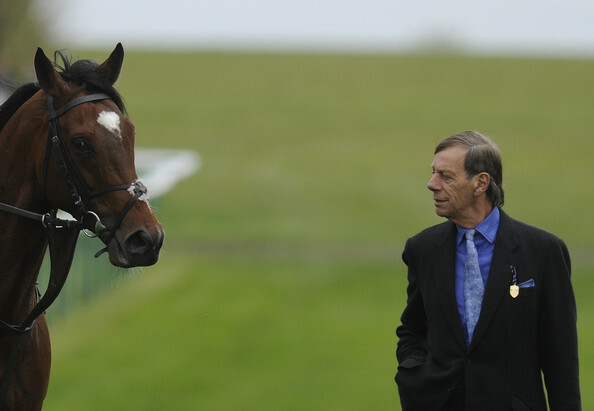 To quote Sir Henry, Frankel was “…very precocious, strong and free” in the early years. It fell to Sir Henry and his “lads”– including Queally — to shape the extravagant youngster into a disciplined race horse without breaking either his spirit or his enthusiasm for running. And that is no small task, as any trainer will tell you. Most recently, John Sherriffs is credited with confiding to his wife, Dottie Ingordo, that if he could just “… get her right,” his 2 year-old might never be beaten. The “her” was, of course, Zenyatta. And how did Sir Henry and his team do it? With firmness, understanding and love. 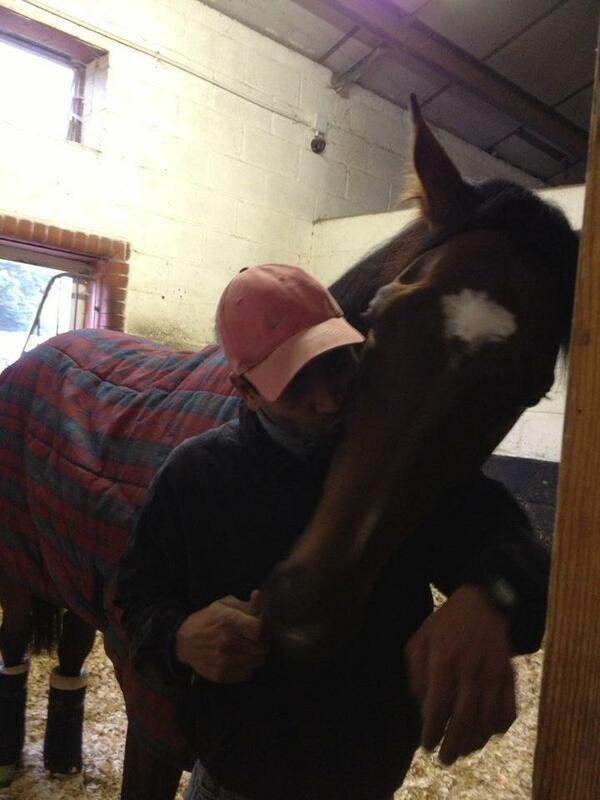 Frankel hugs close to Sandy for reassurance. 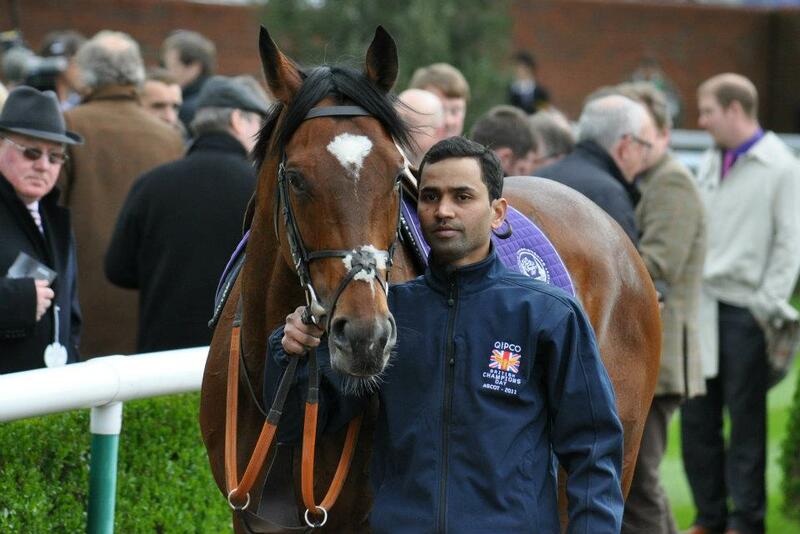 Frankel and his best friend, Sandeep Gauravaram. Photo and copyright, Vickiee Treacle Fletcher. Shane Fetherstonhaugh, from Skerries in North County Dublin, was another key figure in the making of the champion. From January 2011 until his retirement, it was Shane who rode Frankel daily and applied all of his considerable skill to keeping him physically fit, mentally alert and spiritually happy within. Shane is a quiet, calm man who kept Frankel to a daily routine that his charge depended upon. In fact, even though all horses love routine principally because it allows them the security of predicting events, Frankel got more upset than most if that routine changed in any way. Sir Henry first moved him out of his familiar box stall to more commodious quarters in what is referred to as “Millionaires Row” after Frankel won the Dewhurst. His new stall was twice the size of his former, and a good deal quieter. But Frankel wanted none of it. He refused to eat and kept trying to escape. Two days later, he was moved to another quiet area, but that shift lasted about 10 minutes. After a good deal of noisy protest, Frankel was moved back to his usual digs, where he collapsed happily and rolled around in his bedding with something approaching ecstatic relief. Frankel has an enormous appetite for both food and sleep, so Sir Henry — affectionately known as “The Boss” to his Warren Place family — quite sensibly thought a transfer to a quieter, roomier space would be appreciated. 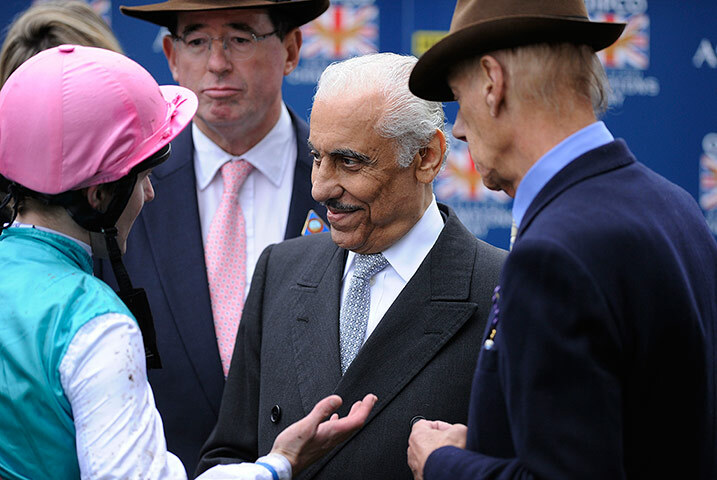 But, as Sandy noted, “Frankel is a nosey kind of guy, you know? All he wants to do is look at what the other horses are doing around him.” And the space that offered the greatest diversion was his original box stall, located in a particularly active section of Sir Henry’s stables. 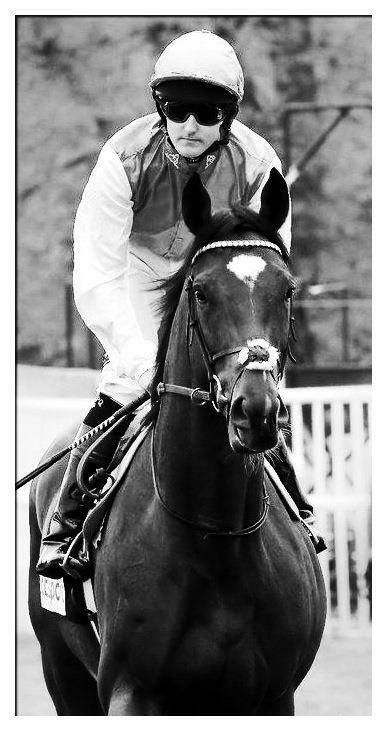 On the gallops at Newmarket with Shane. Since he was slow to mature, it took Frankel well into his second racing season before he was able to transfer what he was learning daily from Shane to an actual race. It’s easy to ruin a thoroughbred if he, or she, is handled poorly in training. The late Sir Vincent O’Brien credited the success of Nijinsky to “lads who were very good indeed and knew how to handle him without breaking his spirit.” The same has been said of Shane, who needed to teach Frankel how to work in tandem with a rider without destroying the horse’s confidence or his desire to run. Whether equine or human, athletes must relax to perform at their peak, since it is in this alert, relaxed state that the heart and lungs are able to do their best work. In the case of a thoroughbred, settling is a close accompaniment to learning to pace oneself early in a race, since a rank horse will use up all of its energy well before the finish, when it’s needed most. Getting Frankel to settle, or relax, was a long, arduous process and Shane played as key a part in accomplishing this as did Sir Henry and Tom Queally, Frankel’s jockey. Their collaborative effort stands as a testimonial to the excellence of Frankel’s team: by Frankel’s third and final racing season, the whole world could see the result. Four year-old Frankel had matured into a polished athlete who settled almost immediately, pacing himself until Tom Queally asked him the question. And when Queally asked, the response was immediate. The younger Frankel seemed a universe away from the 4 year-old who was caught sleeping at the start of the 2012 Champion Stakes. Even Sir Henry had to admit that he, Shane and Tom might have been a little too successful in teaching their colt how to relax. It would be Shane Fetherstonhaugh who would teach a brilliant horse how to relax and get into “the zone” that is so essential if an athlete is to succeed. 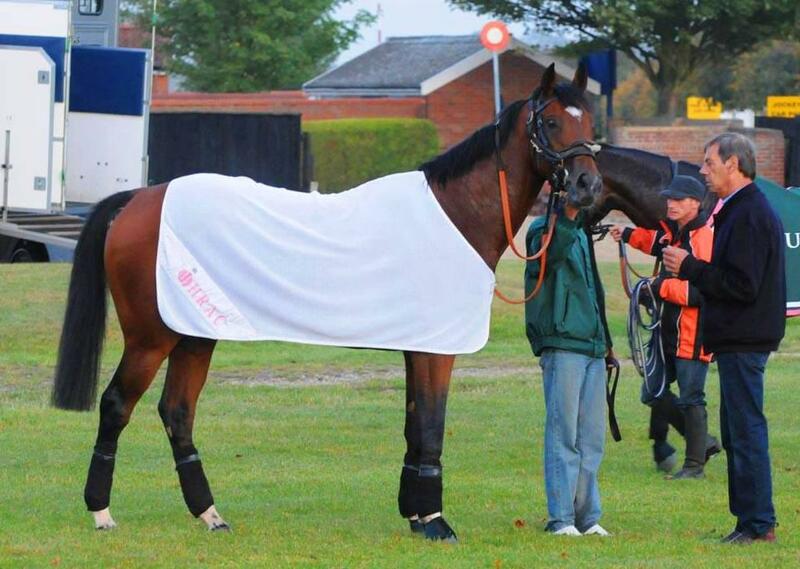 Shane and Frankel, or “Usain Colt” as he has been recently nicknamed at Warren Place, coming home from the gallops. (July 12, 2012). 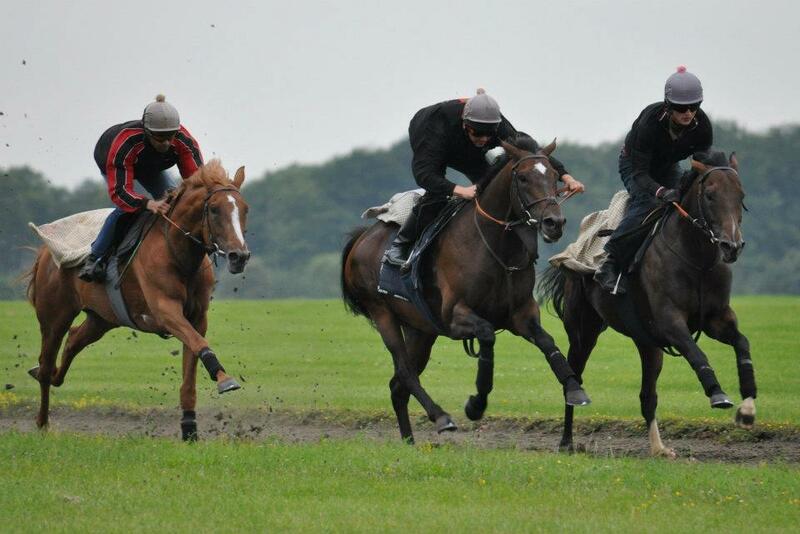 Below, Frankel and Shane, together with Bullet Train and Danny Dunnachie, on one of their works together. This is the world that Frankel knows best….out on Newmarket Heath with Bullet Train, where the turf smells sweet and there is nothing but the sound of his own heart and hooves, the ministration of hands and the timbre of familiar voices. While it was, without question, the daily input of Sandy and Shane that allowed Sir Henry to make informed decisions about every aspect of Frankel’s development, Tom Queally, Bullet Train and Ian Mongan had their own roles to play in the making of a champion. It is no accident that the arrival of pace-setter Bullet Train marked the beginning of a more settled, responsive Frankel on race day. The champ’s older half-brother became his regular work-mate at home, since Bullet Train was the only horse at Warren Place who could keep up with Frankel on a daily basis. On race day, it was Bullet Train and Ian Mongan who ensured an honest pace, focusing Frankel on the task at hand and setting him up to win. 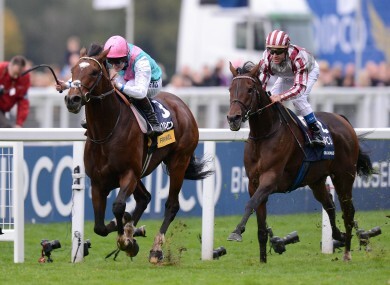 Ian was brilliant enough to salvage Frankel’s slow start on Champions Day and Bullet Train was more than courageous, taking on Cirrus Des Aigles, the best in the world on soft turf and the second-best horse to Frankel in world rankings. Bullet Train showed his mettle time and again, stretching himself considerably beyond his own comfort zone each time he was asked. And as he’s been such an important player in Frankel’s success story, it seemed only fitting that Bullet Train would join him in retirement. 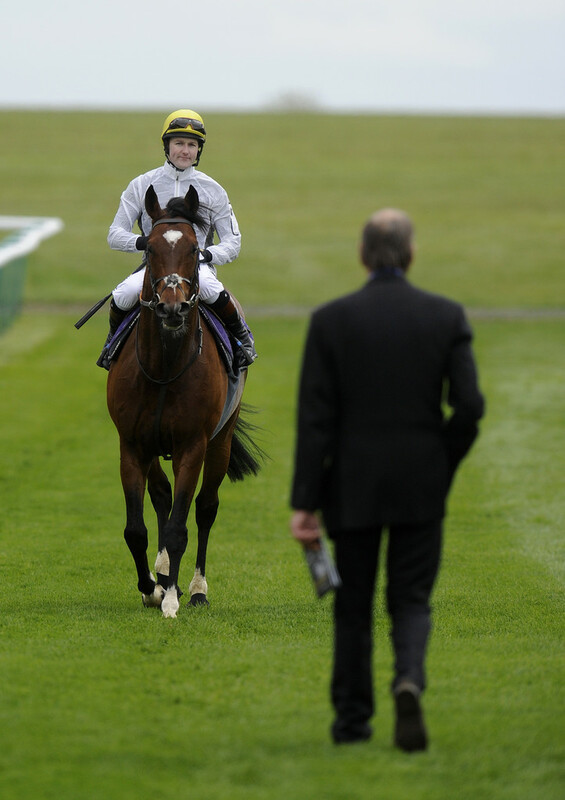 Ian Mongan on Bullet Train and Tom Queally on Frankel embrace as they return following the latter’s emphatic win in the 2012 Champion Stakes. 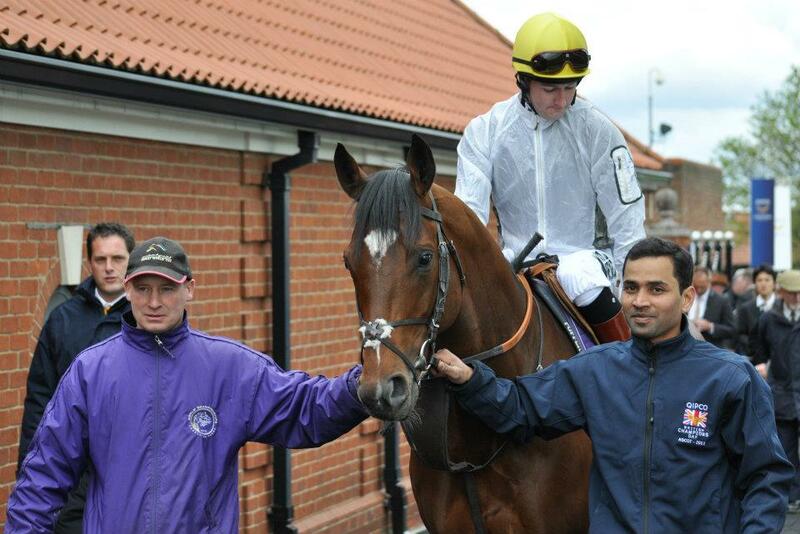 To jockey Tom Queally belongs the silence of the turf, when it is just you, your horse and a race to be won. Far away from the crowd and the cameras, it is during these moments that jockey and horse either come together, or they don’t. Tom is a calm, cool and unassuming man who abjures publicity and tends to be short on words when interviewed. The Dungarven, Ireland native is only 27 years old, but he has already ridden for Aidan O’Brien and became Sir Henry’s first jockey in 2009, although not under contract to him (i.e. meaning that he can ride other trainers’ horses as well). The two get along famously and Tom has learned that Sir Henry is as intuitive as he is methodical in his training methods. Queally attributes his own professional growth to The Boss’ knowledgeable coaching and encouragement. The brilliant mare Midday was Tom’s most famous Cecil-trained mount before Frankel, and he rode her to victory in both the Nassau Stakes at Glorious Goodwood and the 2009 Breeders’ Cup Filly and Mare Turf at Santa Anita. As well, Tom gave British champion Twice Over an absolutely brilliant ride in the 2009 Breeders’ Cup Classic, finishing third behind winner Zenyatta and second-placed Gio Ponti . It’s fair to say that Tom Queally was already on his way to a sterling career before Frankel streaked into his life. But now he’s a household name and has had the somewhat double-edged honour of meeting up with the best thoroughbred he may ever ride only nine years into his career. Clearly, Frankel and Queally have a special relationship. And although he played his part in raising a champion, Tom confesses to loving their time alone out on the course most of all. He talked to Frankel as they went down to the start and urged him along with his voice throughout a race. And he still hasn’t gotten used to Frankel’s power-surge, even though he’s the one who pushed the button. Will we ever forget the cry of “Queally says ‘Go’ on The Champ …” accompanied by the signature shake of the reins and pumping arms, as man and horse merged into a single, driving force? 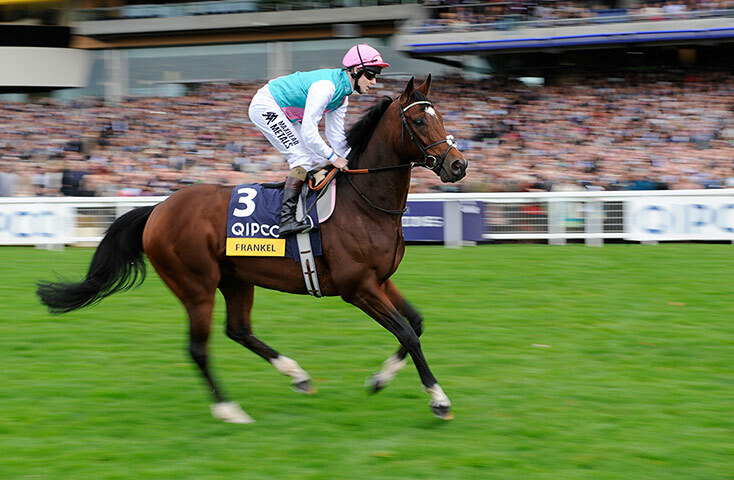 Happy to be out on the turf and away from the crowds, Frankel goes down to the start of the 2012 Champion Stakes with Tom. 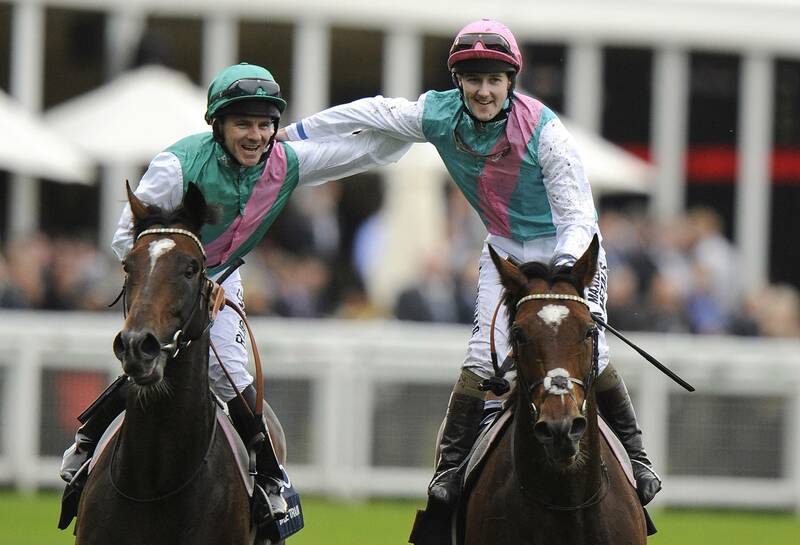 A familiar sight destined to become the stuff of legendary tales — Tom Queally and Frankel. 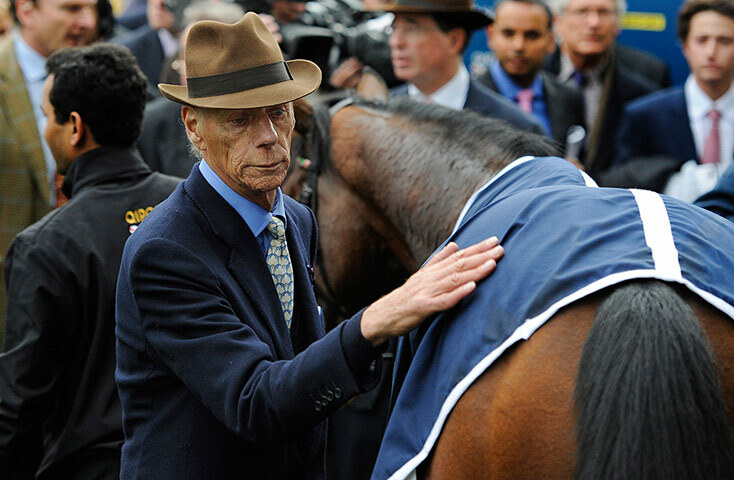 And now we come full circle, back to the skill of one of thoroughbred horse racing’s greatest trainers, Sir Henry Cecil. 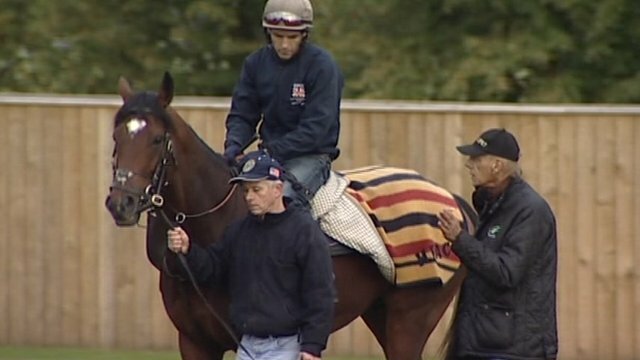 Battling stomach cancer and barely able to speak, Cecil managed to whisper that training Frankel had been “a great privilege” and that the horse had been his inspiration during chemotherapy treatments. After the Champion Stakes, wiping a tear from his eye, it must have dawned on Sir Henry that Frankel had shown himself to be the same kind of fighter that he himself had been throughout his life: despite a ground he detested and a poor start, racing at over a mile for only the second time in his life, his colt had quite simply refused to give up. A tender Sir Henry Cecil not only straightens Frankel’s blanket, but performs a kind of “laying on of hands” on a horse he truly loves. Cecil has been brilliant at bringing Frankel along in time to be at his very best before each of his fourteen races, while also proving adept at keeping cycles of training and competition in complete sync with the needs of the horse himself. 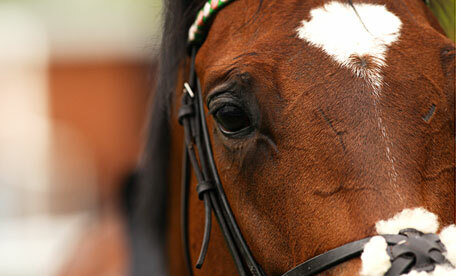 It may sound easy, but think a moment: have we ever seen an “off” Frankel, a Frankel that didn’t “show up” on the day? Sir Henry, Frankel and Sandy. Cecil arranged for Frankel to have a gallop at Newmarket more than once, so that his fans could see him and so his colt would think he’d won another race. As the brilliant American physicist Richard Feynman was to observe, an ideal team creates a kind of third identity, an entity beyond the individual egos or aspirations of its members. Within that third identity is a common, shared goal that each team member works towards realizing, bringing the best of their individual assets, knowledge and abilities to the task. In the case of Frankel’s team, the goal was intimately related to a living, breathing being — a horse whose brilliance and natural talent needed to be sculpted into the refinement of a champion athlete. It was in this context that Sir Henry Cecil, owner Prince Khalid Abdullah, racing manager Lord Teddy Grimthorpe, Sandeep Gauravaram, Shane Fetherstonhaugh, Tom Queally and “outrider” Ian Mongan teamed up and so perfect was this alliance that not a single one of them is prepared to take total credit for Frankel’s illustrious career. It’s because they know that they shared a common dream. …and they know that they all did their part, in the kind of perfect syncopation that would be the envy of any corporation. Please accept our thanks for taking us, so graciously and generously, on this compelling journey with you. It’s clear that Frankel ran on the wings of faith — and love.